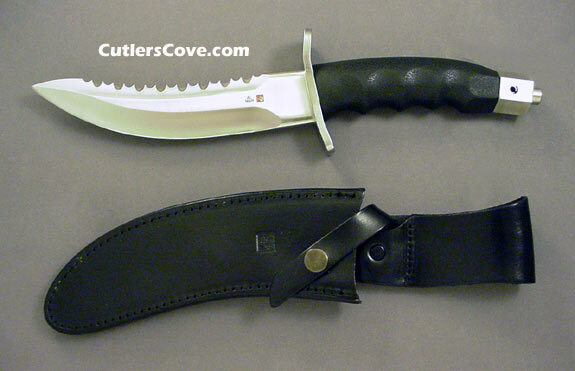 Al Mar Warrior with black handle, satin blade and guard. It is mint with the great original sheath and box. The blade is 7" and it is 13-1/2" overall. The knife has never been used but because of the satin blade finish there are several light surface scratches on the guard and the pommel. It hasn't been carried, used or sharpened. It comes with the original fine leather sheath made by Tex Shoemaker & Son of San Dimas, California. The sheath is black leather. Get it before it is gone! This knife is on the cover of Battle Blades : A Professional's Guide To Combat/Fighting Knives by Greg Walker. Mr. Walker gives an in depth look at Al Mar's Warrior. Click link to order this hard to find book.